I asked what he was putting on his arm and was told that it was a drawing salve to help pull out the splinter and make sure the area didn’t get infected. I was fascinated and wondered if it would work and if it would stain the skin. The farmer assured me that it didn’t stain the skin and that they used it all the time in their community to help with wound healing and drawing out things that were stuck in the skin. He said that it was even effective on some spider bites for drawing out the venom. I asked if there was a place to buy it, and was told that they made it themselves but the farmer offered to write down the recipe for me. We’ve been making variations of this recipe ever since. It takes a while to make but is very effective and well worth the time. We especially use it for splinters and pieces of glass that get stuck in the skin. 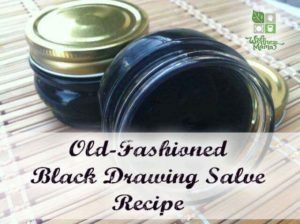 I have not tried it personally for this, but black drawing salves are also said to help remove moles and skin tags. Black drawing salve is a traditional recipe that is naturally antibacterial and skin nourishing. It is said to help draw splinters or other things out of the skin. Powder the herbs and place in a small jar. Pour oil over the herbs. Leave in jar for 3-4 weeks, shaking daily, and then strain through a cheesecloth for use. Heat the herbs and olive oil in a double boiler. Leave on low/medium heat for about an hour until oil gets strong smelling and darker. Strain through cheesecloth for use. Personally, I keep a big jar of olive oil with plantain, comfrey and calendula in my herb cabinet and let it constantly infuse for use in salves and lotions. When the oil is used, I discard the herbs and begin the process again. Combine infused olive oil, shea butter, coconut oil, beeswax, vitamin E oil and honey in a glass jar in a small pan of water. Heat the water to a simmer and carefully stir mixture in the jar until all ingredients are melted. Remove from heat and add activated charcoal, kaolin clay, and lavender essential oil and mix well. Quickly pour in to small jars or tins and let sit until hardened (several hours). Store in airtight container and use as needed on cuts, splinters, etc. Make sure area has been cleaned well. Put a generous amount of black salve on the wound or splinter and cover with gauze or a large bandaid. Leave at least a few hours or overnight to allow it to draw out the infection or object. Some things (like glass… in my experience) may take a day or two and several applications to draw out an object. This salve is a wonderful natural remedy but it is not a replacement for medical care when needed. Consult a doctor before using if you have any health conditions or concerns.